A little over a year ago, I published a post entitled “What Does It Take to Sink a Ship.” It has proven perhaps my most widely read post. The recent sinking of the Japanese fishing vessel Ryou-Un Maru beautifully illustrates the point that ships can be very hard to sink by gun fire. 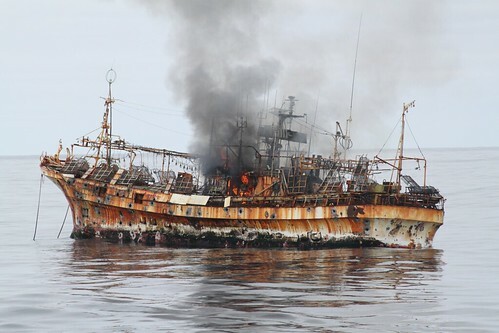 Summary: GULF OF ALASKA – The Japanese fishing vessel, Ryou-Un Maru, shows significant signs of damage after the Coast Guard Cutter Anancapa fired explosive ammunition into it 180 miles west of the Southeast Alaskan coast April 5, 2012. Reportedly the USCGC Anacapa began the operation at 13:00 and the Ryou-Un Maru sank at 18:15. It appears that the F/V may have been hit 100 times by explosive 25mm projectiles. With no crew aboard to do damage control and probably with no real measures taken to ensure water tight doors were closed, it stayed afloat for over five hours and ultimately the Anacapa resorted to pumping water into the vessel to sink it. This was a very small ship, probably less than 500 tons, the implications for our ability to stop a medium to large vessel with a determined crew on board, bent on using the vessel for a terrorist act in an American port should be obvious. With even crude and unsophisticated measures to protect vital machinery and control functions, a ship can resist a great deal of gunfire and continue to its objective. This entry was posted in News and tagged guns, terrorist, torpedoes, Weapons by Chuck Hill. Bookmark the permalink. Yep, all showing up now. Appreciate your efforts on this and other issues. 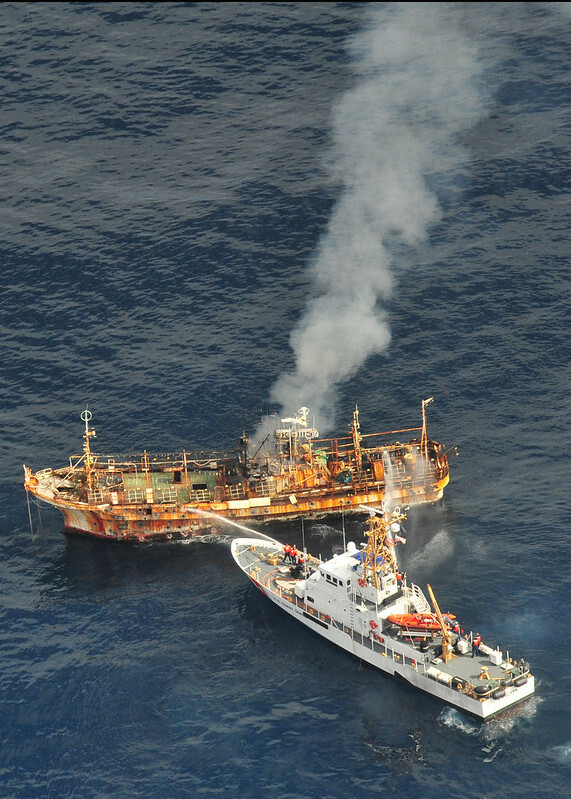 You didn’t cover the fire on CGC Diligence however. Its critical that these events get as much lip service as possible in the media….they are sure to become more frequent. Hopefully fires never become routine, but they do happen and in this case it appears to have been relatively minor. I’m not in a position to say if it was a problem of age, training, poor practice, or just bad luck. The second report is better and makes a connection to a previous generator casualty that caused to ship to abort a mission with the loss of three weeks underway. An opportunity that may have been missed (we never know what the reporter was really told), is that not only is the Diligence 49 years old and that it is due for replacement, but that the replacement probably will not happen until at least 2020 when the ship will be 57 years old. It appears the rounds were fired to hit and not to sink. From the photograph, the majority of the hits are well above the water line and not concentrated in any one particular area. It may also be a matter for ship to ship gunfire tactics. The Coast Guard is not trained to sink ships. The Coast Guard is trained for fire warning shots. It also appears the commence fire command was given at to great a distance. For an unarmed, unmanned vessel, why not get within “musket range” and circle around to the vulnerable sides, preferably on this class in the largest voids of engine and fish tanks. I am sure the crew was having fun. Even the WPBs in the Persian Gulf have not fired this much 25mm. It may be a bad idea to install two 25mm on board, one fore, one aft. The Mk38 mod2 should help since it will be more accurate, and a 57 mm would certainly have been more effective against this size ship, but basically it is a problem that guns make holes above the water line and that does not let in the water. The explosives on these relatively small projectiles (and I include 57mm) don’t rip big holes in the hull when they explode. They are effective against unprotected people inside the hull, but they don’t damage heavy equipment like engine blocks or rapidly increase flooding. One report I saw stated that this ship was only 150 tons, imagine it had been 50,000 or even over 100,000 tons, what would it have taken to sink, or at least stop a much larger ship, promptly (in less than 30 minutes)? The 57 mm is probably about 12 time the weight of the 25 mm, but realistically we have to be prepared to forcibly stop ships hundreds of time the size of this one. We are really not ready for that, and neither are the NSCs or OPCs as planned. And the news media kept saying the fired a cannon at it. I thought the CG used water to put out the fire? She went down with a lot of disel fuel onboard too, but they said it would disapate. To much of the world, even among professionals, this type weapon is an “auto-cannon,” so I can not be too upset. I understand the use of fire hoses to sink it was an alternative in the plan all along, but that effort had to be abandoned because they had to get very close and were afraid the ship might capsize unexpectedly. I added a video of the sinking to the original post. Thanks to Robert and Lee. Finally I have found someone who has more knowledge than I who is making the case for better armed Cutters. As recently as today (08/14/17), I was championing the up gunning of the newer Cutters. I cited the 327 and 378 WHECs had the 5/38 gun mounts so there should be no problem carrying something larger. I proposed the 100mm gun as a main gun with the 57mm gun as an aft or secondary battery weapon. I did not know it had to be a weapon in inventory by the navy. I also was unfamiliar with the 5″ Navy gun, figuring all had become standardized with our European allies, as we were supposedly doing when we changed from the .45 to the Beretta 9mm. I have also pushed for a aft gun as the Cutter may not be able to maneuver at all times to bring its forward gun to bear on the target. I have also pushed for a larger gun for gunfire support like we did in Vietnam. A 57mm gun is not capable of that kind of role. A question I have not been able to answer, is the 57 mm gun capable of AA defense and do our Cutters have that radar/gun capability? Also, do you know the reasoning for picking the 57mm gun in the first place? Seeing how ineffective the .25 mm gun is, the service might be better served using the machine gun/mortar combo weapon designed by a Coastie after the 20 mm gun originally fitted to the 82 foot boats sent to Vietnam were also found to be ineffective. Mortars are usually not very accurate against moving targets but this is changing with guided projectiles. There are some modern systems that could be mounted on patrol boats. I’ve done several posts on weapon systems you might want to look through. Just do a search for weapons.